The use of the Enemy= command allows various characteristics of enemies to be changed. For instance their resistance to Lara's gunfire or how much damage they cause to Lara. They can also be configured as mortal or immortal and even explode when killed. Obviously common sense should be used. While it's fun to watch a crocodile explode when killed with pistols it's not very realistic. Slot ...............The slot the enemy occupies in the level wad. HP ................ The enemies resistance to Lara's gunfire. NEF_flags....... These set a particular behaviour for the slot. TombFlags ..... This field should be set to IGNORE. Extra ............ This field is used only with the Wraith 1-4 and the TEETH_SPIKE objects. Damage1,2,3 fields These fields determine the amount of damage the enemy will cause Lara. Because some enemies can use several weapons against Lara these fields allow you to set different amounts of damage for each weapon. 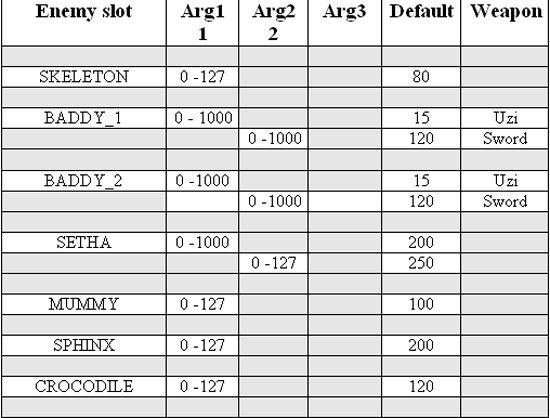 The table below shows each enemy slot along with the recommended range of values which can be used in each of its damage fields (Arg1,2,3). 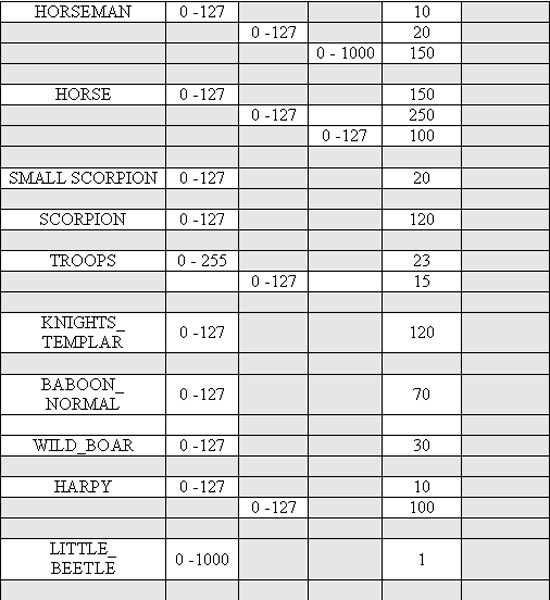 Also shown is the enemies default damage field values along with the weapon used where relevant to the enemy. When the Extra field is used with Wraiths 1-4 a value of 0 will disable burning Lara and a value of 1 will enable burning Lara to death. Using this flag the enemy will explode instantly when killed. Using this flag the enemy will explode after its death animation has ended. The enemy can only be killed with explosive ammo. Will transform immortal enemies into mortals. Lara will not target an enemy with this flag and it becomes immortal. These set the behaviour of Lara's shots on an enemy only one NEF_HIT flag. This will cause blood splatter on the enemy in response to Lara's shots. When combining NEF_flags use the plus symbol as shown in this example.